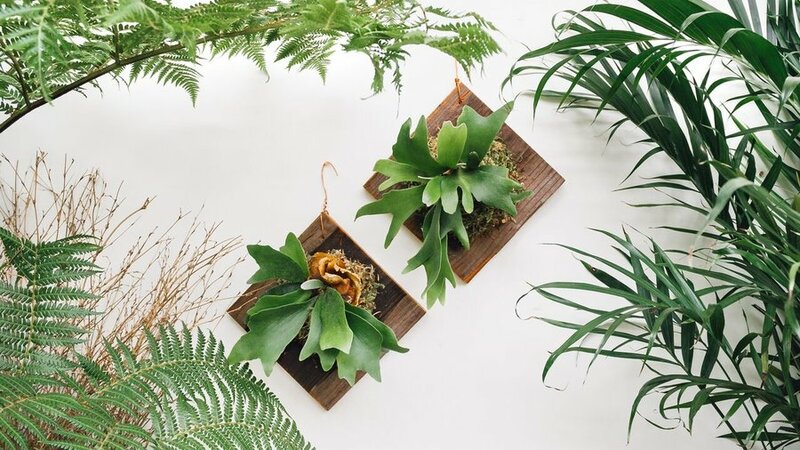 While in the wild staghorn ferns grow on trees, they can also thrive on slabs of bark or wood. The plant gurus at Pistils Nursery in Portland make it easy to look like a living-art pro by offering staghorn ferns mounted on diamond shaped cedar board with sphagnum moss. Arrange a few on a indoor wall and frame with houseplants. Prefer an anchored look for your living wall art? Arrange three or more on a horizontal wall-mounted coat hook to liven up any space. Short on wall space? 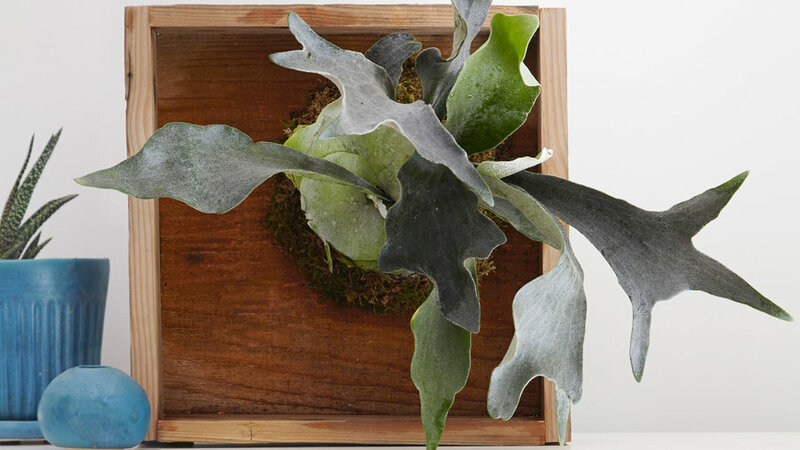 Create this staghorn fern shadow box that can rest on a shelf. "Choose a rot-resistant wood such as cedar, cypress, or redwood," says Caitlin Atkinson, author of Plant Craft: 30 Projects that Add Natural Style to Your Home. 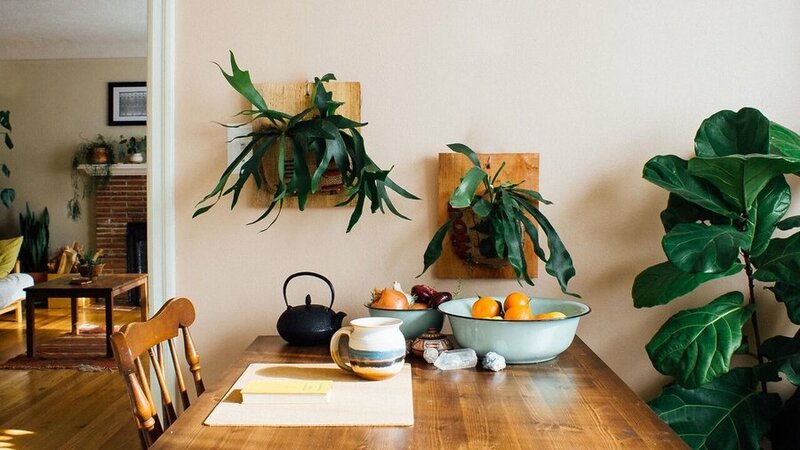 A fun alternative to taxidermy, the antler-like fronds of staghorn ferns add a lively 3D art to any space. 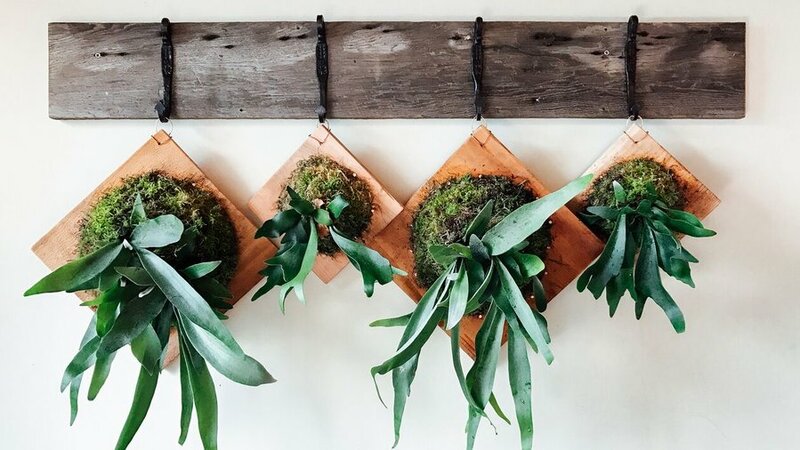 Here, staghorn ferns are mounted on wooden boards and finished vintage burlap. 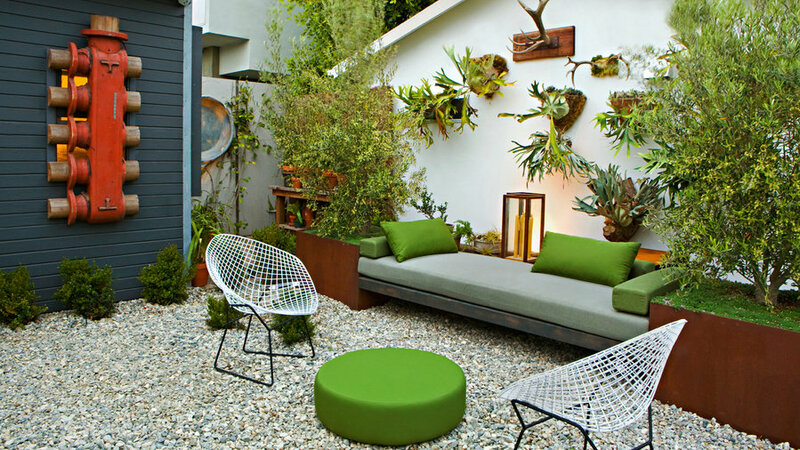 This small outdoor space in Venice, CA lives large with seating edged by planter boxes, natural paving underfoot, and mounted staghorn ferns that mingle gallery-style with mounted antlers. 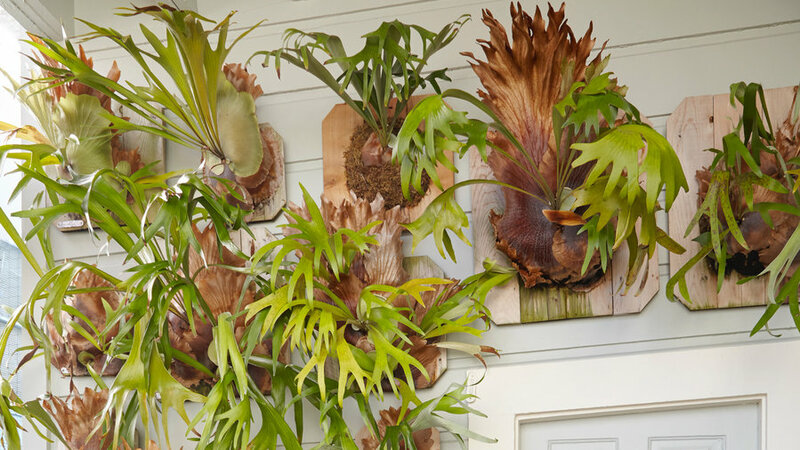 Create an accent wall outdoors by alternating mounted staghorn ferns with beautiful plates. Chose an area that gets part shade and water thoroughly, but not often (only when dry). While we typically see staghorn ferns mounted horizontally as decor, they can thrive vertically too. Here, a staghorn fern adds graphic visual interest to a front door entryway. 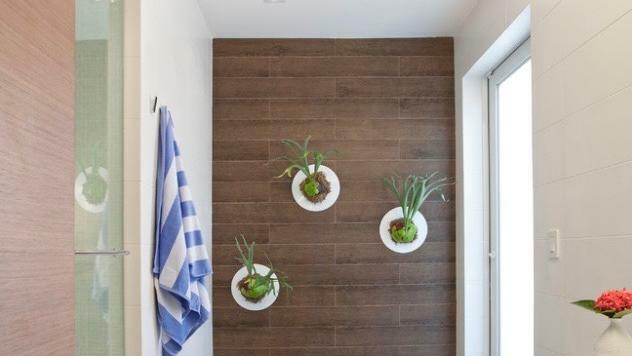 A trio of mounted staghorn ferns arranged at random provide a pop of color and life—and a spa-like serenity—to this bathroom accent wall. 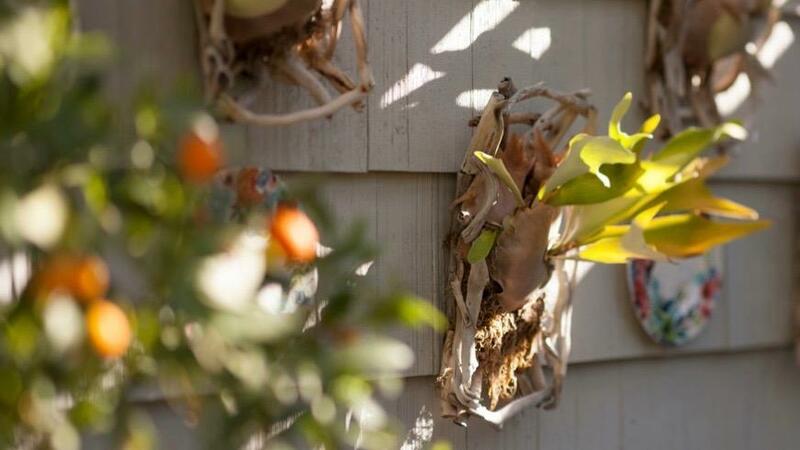 Buy a staghorn fern at a nursery, knock it out of its container and hold it, shield facing up, against a piece of wood. Pack a tight pocket of sphagnum moss (soaked and wrung out) around the shield, and secure the pocket to the wood with fishing line. (As new shields unfurl, they'll hide the line.) Display on an indoor wall that gets indirect light. Remove it once a week to water gently at the sink; use fish emulsion as a fertilizer once a month.